An editorial in party mouthpiece ''Saamana'' said the literary meet''s organisers killed the freedom of expression and self-respect of writers by rescinding the invite. 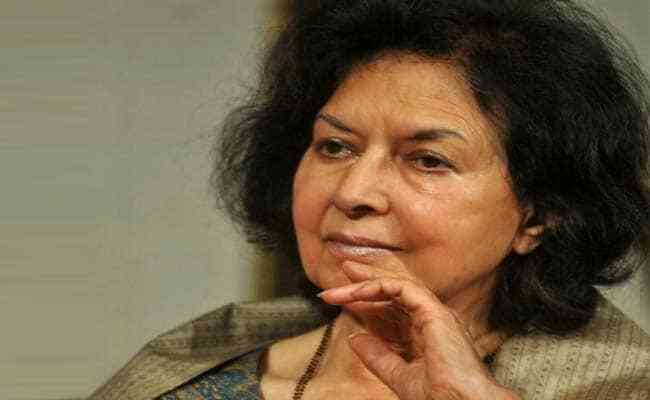 The Shiv Sena on Tuesday claimed author Nayantara Sahgal's invite to the 92nd all-India Marathi literary meet was rescinded after the organisers learnt about her intent to speak on issues like cow-related violence and lynchings and ''misuse'' of government machinery. An editorial in party mouthpiece ''Saamana'' said the literary meet's organisers killed the freedom of expression and self-respect of writers by rescinding the invite. The noted English-language author who was at the forefront of the ''award-wapsi'' (returning of awards) campaign, was to inaugurate 92nd All India Marathi Literary Meet in Yavatmal district of Maharashtra on January 11 in the presence of Chief Minister Devendra Fadnavis. The Sena claimed that Ms Sahgal's speech, in which she planned to speak on mob lynchings, politics of hatred, using government machinery against Opposition, political pressure on journalists and killings of writers, had already been sent to the literary meet's organisers. "The organisers must have thought that they will have to forego ''sarkari meherbani'' (favours from government) if Nayantara Sahgal is called for the event. They have killed the freedom of expression and self-respect of writers," the Uddhav Thackeray-led party said. "Nayantara, who is feared by the ruling party today, is the same person who was jailed during the Emergency for speaking against Indira Gandhi. This means she is not against an ideology or a political party but against all that is wrong," the Marathi daily said. She would have clearly laid down her thoughts in the Marathi literary meet, the Sena said. Her ''kul va mul'' (origin and roots) can be traced to coastal Konkan in Maharashtra, it added. The editorial referred to Maharashtra Navnirman Sena chief Raj Thackeray saying his party has no objection to Ms Sahgal being invited to the literary meet and his apology after a local MNS worker threatened to disrupt the function. The MNS was being made a puppet by someone, the Sena said, but did not mention any name. Amid flak by Opposition leaders and authors over rescinding the invitation to Ms Sahgal for the literary event, the Chief Minister's Office (CMO) had on Monday distanced itself from the controversy. Soon after the CMO's clarification, Ms Sahgal had said she won't attend the meet now even if a fresh invite were to be sent to her. Opposition leaders have alleged that the invitation was cancelled at the behest of the ruling BJP.